Umair Javed is an assistant professor in politics and sociology at the Lahore University of Management Sciences (LUMS) in Lahore, Pakistan. He recently completed a PhD in sociology at the London School of Economics, where his research focused on class politics and labor relations in Pakistan’s informal economy. The victory of the Tehreek-i-Insaf (PTI) in Pakistan’s general elections remains underexplored. Some argue it marks a populist rupture in a previously static political sphere, while others see it as yet another assertion of the dominant military in its propping up of a pliant civilian government. 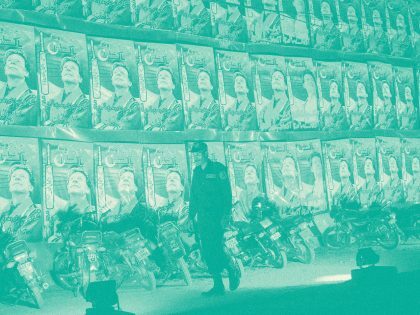 This essay argues that PTI’s win needs to be understood at the intersection of these two trends: a combination of the politically constitutive influence asserted by state institutions, along with the party’s articulation of an uneasy coalition between the newly mobilized middle classes and traditional elites, under the populist rhetoric of a “revolutionary” anti-corruption politics. However, the contradictions of this coalition and the passive incorporation of subaltern classes through traditional politics mean that this victory should be viewed as accelerated continuity, rather than change, in Pakistan’s elite-dominated political sphere.